The Indy Lights presented by Cooper Tire series arrived a day early for an hour and a half test session on Thursday night before the Indy Lights Iowa 115 to test a new compound of rubber (more on that later). There were no on-track incidents. Schmidt Peterson Motorsports with Curb-Agajanian rookie Ethan Ringel was only able to turn 12 laps because his flight to Iowa arrived late. The 14 drivers entered in the Pro Mazda Iowa 100 got their first taste of the Iowa Speedway at 9:15am. This is the first visit to the 0.894-mile oval for all 14 drivers. The session went green for the first 20 minutes before Raoul Owens had a incident in at the entry to Turn 3. He was able to be towed back to the pits. At that point the top 5 speeds were: Weiron Tan, Santiago Urrutia, Dalton Kellett, Will Owen and Garett Grist. The track was only green for a few minutes before the yellow flag flew for the second time. This time it was for Tan, who hit the wall at the exit of Turn 2 and damaged the right front suspension, nose and front wing on the No. 22 Andretti Autosport machine. TSO was able to talk to Tan after the session and he said that the car got unsettled over one of the Turn 2 bumps. The track went back to green and Tan’s quick time was eclipsed by a pair of quick Canadians, Juncos Racing sophomore Garett Grist and Dalton Kellett. Canadian rookie Daniel Burkett has one of the more unique fire suits we have seen. (we are definitely going to find out the story behind this). 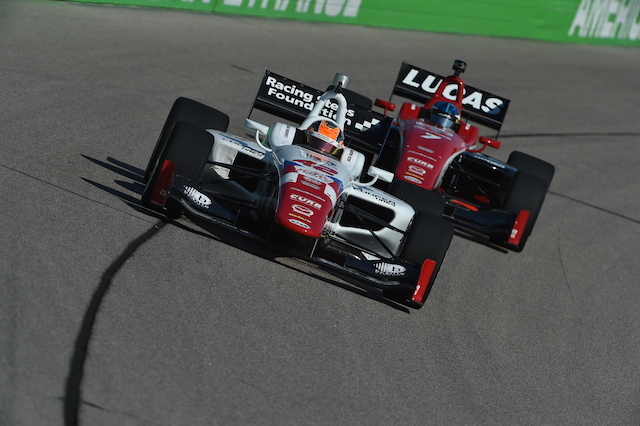 The Indy Lights presented by Cooper Tire series took to the 0.894-mile variably banked Iowa Speedway oval at 10:15am for a 45 minute practice session. Championship point leader Jack Harvey ran only five laps and told Indy Car Radio that they won’t be running at this time of day, so they decided to wait until the afternoon session to turn the majority of their practice laps. That is certainly one of the benefits of being part of a four car team. Harvey can save a set of tires for more representative atmospheric conditions and share in the knowledge that his Schmidt Peterson Motorsports with Curb-Agajanian teammates gather. The teams receive two new sets of Cooper Tire Racing slicks and are allowed to bring one carry over set of tires from the Milwaukee race weekend or Iowa test. The top five after the first twenty minutes of practice were: Harvey, RC Enerson, Scott Anderson, Ethan Ringel and Kyle Kaiser. Andersen Promotions just released the Chris Griffis Memorial Test date and locations and American open wheel fans will excited by location of the annual season ending test. A full compliment of USF2000, Pro Mazda and Indy Lights will test on the 20 turn 3.427 mile road course at the Circuit of The America’s in Austin Texas. The dates for the fifth annual test named after former Schmidt Peterson Motorsports with Curb-Agajanian Indy Lights team manager will be November 21-22, 2015. “We are excited to announce that our fifth annual Chris Griffis test will take place at COTA and will give our current drivers and newcomers to our series the opportunity to drive this state-of-the-art circuit,” said Dan Andersen, Owner and CEO of Andersen Promotions. “Numerous teams and drivers have used this as a ‘try-out’ and we are pleased to continue to offer this now traditional test.